Pieter Mortier (1661–1711) was an 18th-century mapmaker and engraver from the Northern Netherlands. Mortier had a partnership with Johannes Covens I (1697-1774)  and founded the map publishing company Covens & Mortier (1721-1866). Mortier, being French himself, had easy access to French cartographers such as De L'Isle, Sanson, Jaillot, de Fer and De Wit. Consequently, much of Mortier's business was built upon leveraging the sophisticated Dutch printing establishment to issue embellished high quality editions of previously contemporary French maps. In the greater context of global cartography, this was a significant advantage as most Dutch map publishes had, at this point, fallen into the miasma of reprinting their own outdated works. By contrast, the cartographers of France were producing the most accurate and up to date charts anywhere. Mortier's cartographic work culminated in the magnificent nautical atlas, Le Neptune Francois. Upon Pierre's death in 1711 this business was inherited by his widow. In 1721 his son Cornelius Mortier took over the day to day operation of the firm. Cornelius partnered with his brother-in-law Jean Covens to form one of history's great cartographic partnerships - Covens and Mortier - which continued to publish maps and atlases until about 1866. 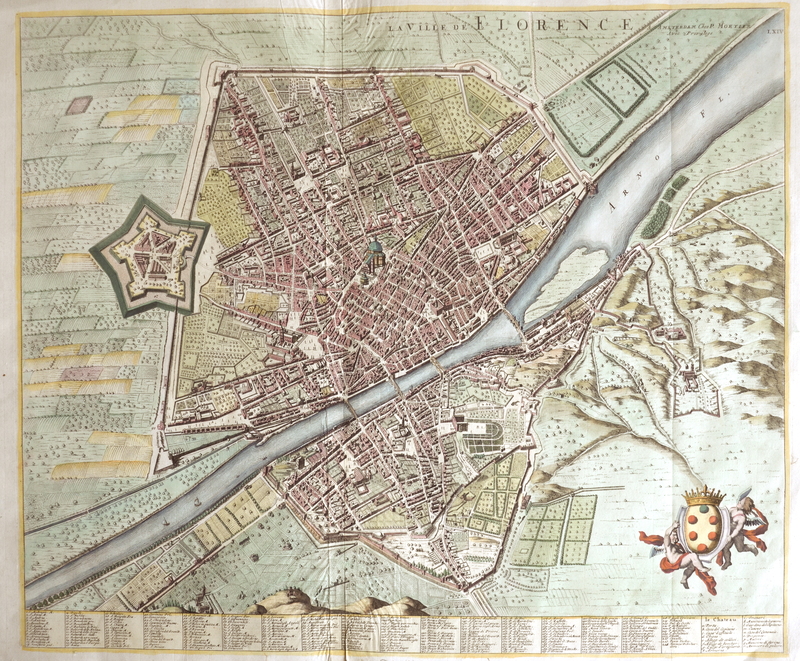 Decorative and detailed city map of Florence in Tuscany, Italy. Florence is the capital city of the Italian region of Tuscany, at the river Arno. Florence was a centre of medieval European trade and finance and one of the wealthiest cities of that era. It is considered the birthplace of the Renaissance, and has been called "the Athens of the Middle Ages". A turbulent political history includes periods of rule by the powerful Medici family and numerous religious and republican revolutions. From 1865 to 1871 the city was the capital of the recently established.